Dave and I wanted to eat somewhere closer to Skerrols House on our second night in Islay as we had spent the day driving around the Isle, stopping for whisky tastings along the way. We popped in to the Bridgend Hotel on our way back to our accommodation and we were warmly greeted by the young lady behind the bar. The hotel provides dining options in the bar as well as the restaurant, and during quiet times, the restaurant is booked first to ensure people are not scattered between the two places. We booked our table and were told that Lauren would be there to meet us when we arrived back for dinner. When we walked back in later that evening it was as if we were long lost friends returning for a visit. 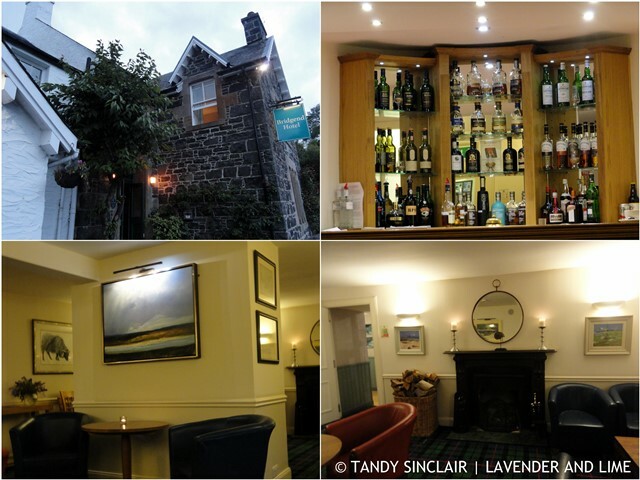 We were seated in the lounge and given the wine menu to peruse as well as the menus from both the pub and the restaurant. While I was choosing which whisky to enjoy (my first one was the Arbeg Eigeadail) and Dave was waiting for his Belhaven, Dave got chatting to a table of gentlemen from Sweden. They had ordered a bottle of Meerlust wine and they got talking about the estate and how good the wine is. After placing our order we were shown to the table and brought bread to enjoy while we waited for our meal. 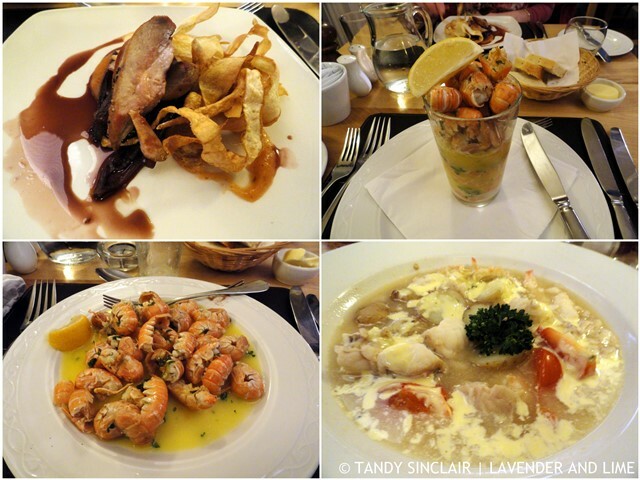 I had the red partridge to start (£7.95) and Dave had a pint of langoustines (£7.50). My partridge was a bit dry, but the langoustine tail I had from Dave more than made up for that. Our main course choices were the Islay estate venison casserole (£12.50) for Dave and the Islay seafood and shellfish stew (£19.95) for me. Dave’s meal was from the pub menu and mine from the restaurant menu. Both our main meals were excellent and I am really glad I chose the seafood option. We had a second round of drinks with Dave sticking to his beer and I went for the Jura Elixer. Our meal came to £61.50 excluding gratuity. The service was excellent and the atmosphere very warming and welcoming. It sounds like a wonderful place to dine-although you found the partridge a bit dry I would have picked it too before knowing because I think I’ve only had partridge just a couple of times in my life. I know of a whisky chef and writer who lives on Islay. Windswept and beautiful! Sounds like a wonderful meal Tandy, the seafood looks amazing! This hotel looks like a beautiful way to spend family time! Red partridge sounds like like a good choice to me!